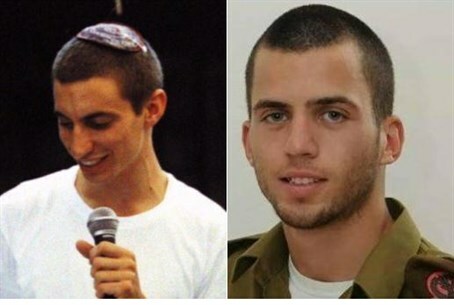 A senior Hamas source reported on Wednesday that Israel has contacted his terrorist organization in a request for the return of the bodies of fallen IDF soldiers Hadar Goldin and Oron Shaul, who were killed in last summer's Operation Protective Edge. The source told a Turkish news agency that a European intermediary contacted Hamas on Israel's behalf four weeks ago, asking to discuss the return of the bodies. According to the report Hamas has refused to even discuss the topic, unless all terrorists freed in the 2011 Gilad Shalit deal who were rearrested since for returning to terror are released. In the Shalit deal a total of 1,027 terrorists were released. The report comes after Hamas leader Ismail Haniyeh said this week that Israel has promised it "will not launch another war in Gaza," in a message that was likewise delivered by a third party intermediary. Former MK Dr. Michael Ben-Ari responded to the report with fury and a call for action. "It becomes clear that the government of Israel once again is going down on its knees before this gang so that they will return to us the bodies of these saints," wrote Ben-Ari on Facebook. "Instead of simply cutting off their water taps, electricity, cement, cell phones and tomatoes." The ex-MK remarked, "if they want to live let them return the bodies of the warriors. There is no reason that we should be 'responsible.' This is the time to go crazy and to show IDF soldiers and their families that they are the dearest thing to us." Ben-Ari has in the past pressed for Israel to solve the terrorist threat from Gaza by eliminating it military and transferring the Arab population to Sinai; in 2005 the Israeli government forcibly expelled the entire Jewish population from Gaza in the Disengagement plan. Goldin, a first lieutenant in the Givati Brigade, was killed on August 1, 2014 at the height of the operation after Hamas terrorists breached one of several ceasefires to attack his unit on the outskirts of the city of Rafah. Likewise, Golani Brigade First Sergeant Oron Shaul was killed the previous month during clashes between Hamas infiltrators and the IDF in the Gaza Belt and his body was also captured by terrorists. The families of the two last month demanded that the government not make unprecedented Ramadan "gestures" such as direct buses from Arab towns in Judea, Samaria and Gaza to the Temple Mount unless the return of the bodies was stipulated as a condition. Several "gestures" were indeed cancelled or temporarily pulled, but not as a condition for the return of the bodies - instead the moves came after Arab terrorists launched shooting, stabbing and rocket attacks that quickly flared up with Ramadan.